Flood of Fire begins with the fallout of the financial disaster than befell the Indian merchant Bahram when the Chinese cracked down on the opium trade. His widow Shireen is bankrupt, but she knows there’s something odd about the way he died. It’s not easy for her to leave the purdah that has always confined her, but Shireen is a splendid character – she gets a wardrobe of western clothes ready and sets off for Canton to restore her husband’s reputation and claim her share of the compensation that the opium merchants are demanding from the Chinese government. They intend to get it too. As I suggested in my review of River of Smoke, the British merchants are determined to impose their version of Free Trade on China, and for strategic reasons, it suits the British government to go to war over it. (They end up with Hong Kong, as we all know). Among the soldiers that gets caught up in this morally bankrupt conflict is Kesri, a sepoy in colonial India. In ensuing chapters we learn his back story, and how he is connected to one of the survivors of the Ibis disaster off the coast of Mauritius. (Yes, I am being evasive about some of the characters – this is because it takes a pleasurable while for Ghosh to reveal which ones survived the Ibis – and it would spoil the story if I so much as mention their names.) Kesri is the moral compass of the novel: bewitched by the romance of the military life, he disobeys his father and joins up, only to find that he has to deal with the enemy within as well as the opposing forces. There is the racial chasm between the British troops and the sepoys, with differential treatment in pay, accommodation and status, exemplified over and over again in the overt disdain that marked every interaction. But there is also the sometimes brutal jealousy of the other sepoys, which always has the potential to wreck Kesri’s military career. The omniscient narrator tells this story from his point-of-view, revealing his inner torments about where his loyalties lie – but time and again we see him show valour and wisdom in his interactions with lesser men, as well as on the battlefield. He is also loyal to an officer who becomes his friend, a troubled man who lost the love of his life because he was of the wrong class. There are reviews all over the place, but I liked this one at the Financial Times. Update: Janine at The Resident Judge of Port Phillip has reviewed it too, bringing an historian’s perspective to the reading. Oh I had to skim your post, Lisa, because Flood of Fire is very (!) high on my TBR list – next, maybe. I’ve read the prior 2 and loved them – been looking forward to this. Yay, you are going to love it! I went through an Indian lit phase about 15 yrs ago, but somehow missed out on reading Ghosh at the time. You’ve made this trio sound VERY tempting, although I have no idea how to fit them in to my current reading life. Thanks! 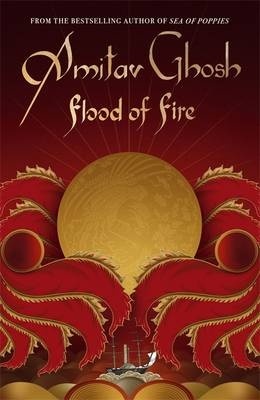 I haven’t read enough of Ghosh to know if this is right, but I read somewhere recently that the Ibis trilogy is a complete departure for Ghosh. Obviously a very successful one. The only other one I’ve read is The Glass Palace which I read more than a decade ago and I don’t remember it very well, but I rated it 4 stars at Goodreads so I must have liked it a lot. (LOL I’m a bit mean with my stars.) I would like to read The Hungry Tide, but yes, how to fit in in, is the perennial problem! I read and loved the first in this trilogy a while back now and the 2nd book has been languishing on my shelves ever since. I obviously need to move it up in rank if there is a third already out! I’m glad you said it’s not necessary to read the other books in the series because I’ve forgotten a lot of the first book. This happens to me all the time, I get left behind and an author brings out a new one before I’ve read the last one. At the moment I’m reading David Mitchell’s The Thousand Autumns of Jacob de Zoet, and how long ago was that released? Yes, I know what you mean about blind-buying. It doesn’t happen often, but often enough to be disconcerting, that books get published which are not quite worthy of their authors. Sometimes I think it’s pressure to *produce* that affects everyone in the chain, and so a book that isn’t ready – and could perhaps be so much better – gets onto the shelves to disappoint the hapless buyer.